This kind of maximum capacity exercise routine can get great fitness and health results ranging in as little as seven to twenty minutes a few times a week. The intensity during the high intensity work interval should range ≥ 80% of your estimated maximal heart rate*. The work interval should feel like you are exercising “hard” to “very hard”and be uncomfortable. Using the talk test as a guide, it would be like carrying on a conversation but with difficulty. 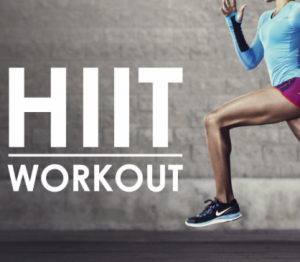 According to research HIIT is an efficient means of exercise to help decrease body fat, improve insulin sensitivity (a marker linked with type 2 diabetes) and boost exercise capacity, endurance and muscular fitness. 7% of individuals are considered non responders to this form of exercise. This is because there could be underlying conditions such as low thyroid activity, insulin resistance or hormonal issues interfering with the full benefits HIIT. * To work out your maximal heart rate use the following formula: 207 – 70% of your age. HIIT workouts are more exhaustive then steady state endurance workouts. Consequently, a longer recovery period is needed especially when first starting out on HIIT. Steady state exercise refers to any activity that is performed at a relatively constant speed for an extended period of time as well as a balance between energy required and energy available during exercise. Steady state exercise typically occurs at a moderate intensity where heart rate usually falls in the range of 55 to 69%. Depending on the individual, one possible mode would be to start with one HIIT workout a week, with other workouts being steady state workouts. 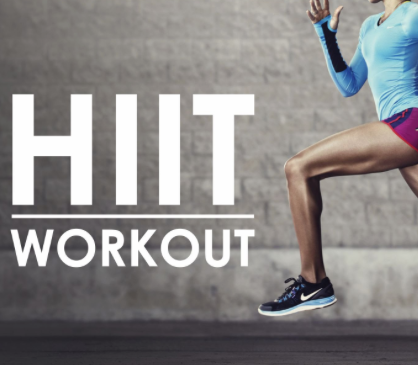 As confidence builds, add a second and third HIIT workout throughout the week, making sure the HIIT workouts are spread throughout the week. The post-exercise period is called excess post-exercise oxygen consumption (EPOC). This is generally about a 2 hour period after an exercise session where the body is restoring itself to pre-exercise levels and thus using more energy. Because of the vigorous contractile nature of HIIT workouts, the EPOC generally tends to be modestly greater, adding about 6 to 15% more calories to the overall workout energy expenditure. Of key concern in obesity is visceral fat. Visceral fat is body fat that is stored within the abdominal cavity and is consequently stored around a number of important internal organs such as the liver, pancreas and intestines. Visceral fat plays a distinctive and potentially dangerous role affecting how our hormones function. Storing higher amounts of visceral fat is associated with increased risks of a number of health problems including type 2 diabetes, heart disease and Alzheimers Disease. In the late 1970’s, early 1980’s there was a dramatic increase in high caloric, highly processed and easily digested foods being introduced into our diets. Concurrently there was a marked disappearance in physicality to be replaced by idle and passive lifestyles. These two factors played and are still playing a key role in the dramatic increase in obesity in Australia and many other countries in the western world. A recent study compared participants who did steady state cardio for 30 minutes three times a week to those who did 20 minutes of high-intensity interval training (HIIT) three times per week. Both groups showed similar weight loss, but the HIIT group showed a 2% loss in body fat while the steady-state group lost only 0.3%. The HIIT group also gained nearly one kilogram of muscle, while the steady-state group lost almost a half a kilogram. Interval sprinting can last from 6 seconds to minutes with high to flat out intensity. This is usually via cycling but interval sprinting could include running, running up and down stairs and jumping rope. The research focused on intervals that did 8 second sprints followed by 12 seconds of easy with a total of 60 sprints. This equates to a total of 20 minutes for this particular HIIT workout. A visceral fat decrease of 17% in males after 12 weeks of sprinting. A 34% decrease in insulin in females after 15 weeks of interval sprinting. Research has found that aerobic power increased by 18% in females after 12 weeks of sprinting, fish oil (1.8g/ day) and the Mediterranean Diet. Green tea contains an active constituent called catecholamines which have been shown to increase the responses to interval sprinting. Catecholamines work by increasing norepinephrine which in turn increases fat oxidation. A tip is to have lukewarm green tea as there is a 40% increase in energy expenditure to process it compared to drinking the tea hot. Cold water turns on the sympathetic nervous system and helps induce thermogenesis and assists in fat oxidation. Green tea has been shown to decrease fat in the blood by about 30%. There is additional health improvements in combination with interval sprinting such as aerobic fitness, a decrease in fat mass, decrease in visceral fat and an increase in lean muscle mass. If you are concerned about your weight, there is research to support introducing HIIT into your lifestyle. When combined with fish oil, green tea and the Mediterranean diet, the results are extremely encouraging. If you would like further information or guidance in loosing weight, Emed is able to tailor a prescription most suitable to your needs. To organise your free initial consultation click here. Alternatively if you would like to talk to one of our practitioners click here.